Nike has announced a new collection of "Day to Night" Apple Watch bands going on sale soon. 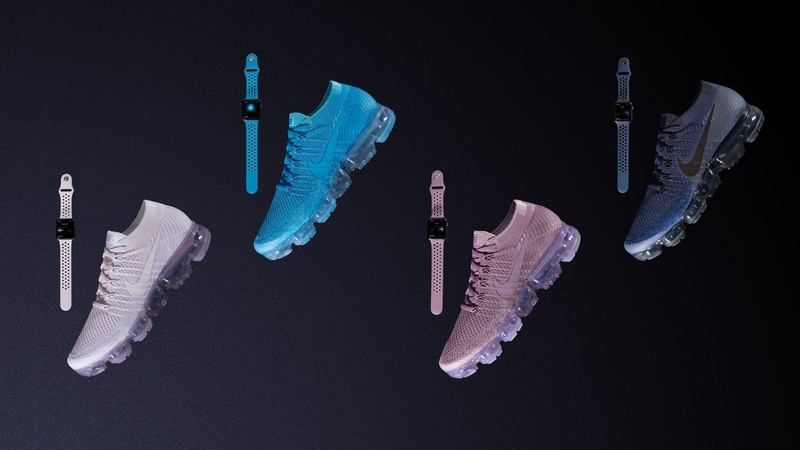 The four new Nike Sport Bands match up with the designs of a collection of Nike shoes: the Nike Air VaporMax Flyknit "Day to Night" collection. This marks the first time Nike has directly paired Watch bands with a shoe line. The "Day to Night" collection celebrates runners whenever they choose to run – at twilight, sunset and everything in between. Each of the colors is inspired by a shade of the sky, from dawn to dusk, and allows runners to – for the first time – make a statement by matching their Apple Watch Nike+ bands to their footwear. Each band will be priced at $49.00 when they go on sale next month. They'll be available from nike.com and select Nike retail stores on June 1, and shortly thereafter from apple.com, Apple Stores, and other retail partners.